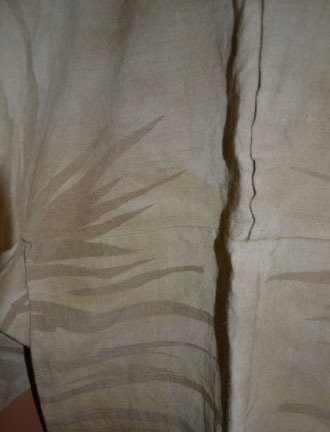 A few more original costume pieces from the Sixth Doctor era have popped up on eBay. These are getting more valuable by the day as this year is the 50th anniversary of Dr Who! 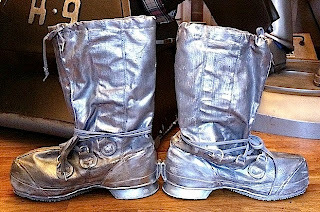 This pair were screen used in Attack of the Cybermen worn by John Ainley, (nephew of 'The Master' Anthony Ainley!) Probably also worn for Five Doctors but as they say 'John Ainley' inside and he was a Cyberman in Attack of the Cybermen but not in Five Doctors, although the BBC used the exact same boots in Five Doctors and they re-use everything, it's a relatively safe assumption it was used for other episodes! 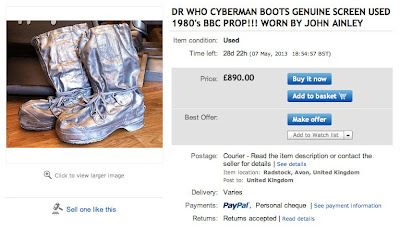 Originally sold off at one of the Longleat Dr Who auctions many years ago although I have no paperwork but as a collector of genuine screen used items, I can tell you that often the best stuff doesn't! Frankly most COAs aren't worth the paper their written on and most of the best props out there from the 60's, 70's and 80's never came with anything because nobody thought of these things! We were just a small cliché of collectors, many years before eBay! Hopefully you can take some solace in the fact I have some very serious props in my collection (see the bottom of this advert for my website where you can see more!) and I only bother with things that are VERY special, as opposed to just being any old pair of boots, which they most certainly are not! 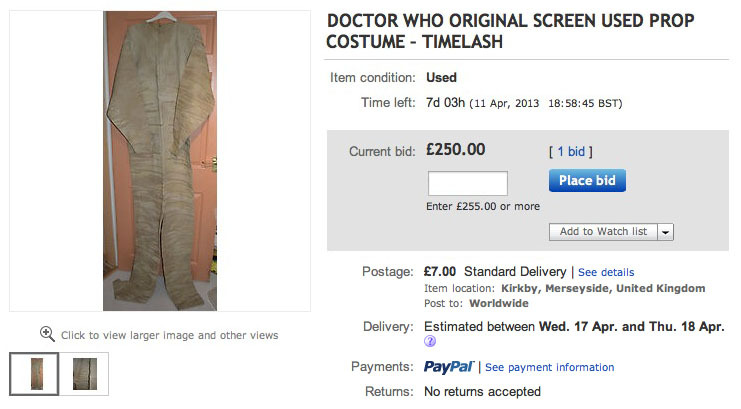 This is a Guard’s costume from the 1985 Doctor Who story Timelash. It is bespoke made from a coarse material with an ‘animal print’ design, fastened by Velcro. The costume is over 8 feet tall, which gives it the loose, baggy design you see on screen in the finished story. These are a selection of operating theatre masks, and armband, from the 1986 Doctor Who story Trial of a Time Lord. Two are modified versions of shop-bought dust masks, the third is bespoke made from the same material as the orange gowns worn throughout the story, with elastic fastenings firmly attached. The arm band is in the same material with a Velcro fastening.